When Frank looked into ways we could view the total solar eclipse this year, the best option seemed to be a cruise in the Pacific, where we could view from the center line. We booked the cruise through Astronomy Vacations, who chartered a cruise ship through Costa Cruises, an Italian cruise line with Asian destinations. The itinerary looked appealing, taking off from Tianjin, sailing to Cheju Island, Korea, then to Kagoshima, Japan, and out to sea to view the eclipse. We decided to disembark at Kobe, Japan to cut it short due to limited vacation time off from work, and to be able to visit friends in Japan. After leaving Tianjin by car, we headed toward the port. We were told that we could board the ship starting at 2:00 pm, and we arrived at the dock at 1:30. Already, there was a huge crowd of people in front of the entrance. Nearly everyone was an American or European, so we figured we were in the right place. There was no real queue, and no one seemed to know what was going on, but one door was open, and everyone was converging toward that door. We managed inch our way inside within a few minutes, where we all filed through a single x-ray screening machine. As far as I could tell, the one we walked through was not actually turned on. We were directed up an escalator, where a long line of people stood waiting to check in. After standing in line for 10 minutes and not moving, some young Chinese women came and ordered, “Only one per party for check in! Take your bags to the waiting room!” so Alex & took the bags and Frank waited in line. About half an hour later, Frank emerged with stickers on our passports. The Customs Office downstairs was not open yet, so we amused ourselves by shopping at the dusty little gift shop on the first level. We found some nice items that were quite a bargain, including a pair of stuffed pandas joined by a string at the lips. When you pulled them apart, they said, “I LOVE YOU!” in a high pitched voice. Alex alternately amused and annoyed the people seated around us in the waiting room by pulling the string repeatedly while we waited. In our quest for Solar Eclipse '09, our first stop was Tianjin, China, a large port city about two hours from Beijing. We landed to incredibly smoggy, gray skies, where the 97 degree heat and 95% humidity had our clothes sticking to us in about 3 seconds flat. "Sticky" and "uncomfortable" don't begin to cover it. The gray haze that covered the city seemed to cover the entire countryside as well, and after seeing the giant industrial smokestacks along the way, we knew it was more than coastal fog. After driving the lonely road from Beijing to Tianjin, we arrived at the lovely Rennaissance Hotel in Tianjin. The Rennaisance in central Tianjin is located across from a grand Concert Hall, and conveniently next to Starbucks and a luxury mall featuring Prada, Cartier and Gucci. From the front, the skyscraper building looks two-dimensional. We were in the part of town the guidebook said was frequented by foreigners searching for a little bit of home in a Subway sandwich and Starbucks half-caff latte. The lobby of the hotel featured a grand staircase on one side and a gorgeous mural of a modern rendition of the Great Wall opposite. It had an "East meets West" feeling, and I immediately felt underdressed and grubby standing there, wearing traveling clothes and needing a shower. We were fortunate to be upgraded to a suite on the Club Floor, which meant free drinks and snacks, along with a very posh two-room suite overlooking the gray smoggy skies of Tianjin. We fought to stay awake long enough to have some snacks and soft drinks in the lounge, where three Chinese women were holed up with laptops and working furiously on some project or another. The staff was friendly and spoke English to us, which was a relief, since our Chinese is limited to “nihao” (“hello”) and “Xiexie” (thank you). We ate a few eggrolls and some custardy dessert of unknown origins, and went back to our luxurious suite. We ordered up a light supper in our room, fought to stay awake, and then promptly crashed around 7:00 pm. Alex was given strict orders that if he were to awaken in the middle of the night, and we were still asleep, he could watch TV in the other room, with the door closed. He mumbled “ok” then fell asleep. At 3:30 am, I woke up and realized there was no going back to sleep. I noticed a couple of beady little eyes staring up at me in the dark and said, “Hi, Alex.” We were all awake, with nothing to do for another 2 ½ hours, when the restaurant opened for breakfast. I made use of the time by sending text messages to my brothers in Texas and to my Twitter account. I was able to use my cell phone in Tianjin, but at $2.99/minute, I opted for texting instead of calling. Plus, I had no earthly idea what time it was in the US, so I thought I'd play it safe. After breakfast, we caught a taxi to another part of town that Frank read had a famous shopping street, rebuilt after a major earthquake. It was pouring rain, and we borrowed an umbrella from the hotel to take along, but it barely covered Alex and me. Street vendors appeared out of nowhere selling cheap umbrellas, so we bought one. Most of the shops seemed to be closed, with the exception of Niketown, a Disney store, and some other sneaker stores that looked suspiciously like Foot Locker. Not exactly the exotic Chinese souvenirs we were looking for after traveling half-way around the world. We’ve taken off on another whirlwind trip, this time a cruise from Tianjin, China, to Cheju Island, Korea, and back out to sea to view a total solar eclipse. At six minutes long, this is set to be the longest eclipse of the century, according to Frank. Our last eclipse tour, also a cruise, took us to Europe and North Africa, with the main event landing us in the Sahara Desert, in Libya. I can’t say that my life has lacked in adventure since I married Frank. Alex was disappointed that we couldn’t sit in First Class, but the price in coach was right (free). We managed to score some Economy Plus seats on United, which is a step above Sardine Class. Our seats for the 12 hour flight were comfortable enough, and we had enough electronic gear along for the ride to keep us occupied, including multiple cameras, laptops, an iPod, a Nintendo DS, a Google Smartphone and in-seat movies. I wonder how the early settlers endured months of riding across the plains on wagon trains without the wonders of video solitaire to pass the time. We flew the Great Circle route, going north out of San Francisco and up over Alaska. We waved down at Sarah Palin, who no doubt is spending time keeping a watchful eye on the skies for Soviet attacks, now that she is gainfully unemployed. Alex made friends in the airport with two sweet kids who, as luck would have it, were sitting one row in front of us. Alex and the boy shared DS games and talked Yugioh shop in between movies. The rest of the time, he rocked out with my iPod, occasionally singing “Eye of the Tiger” at the top of his lungs. I have a hard time sleeping on long flights, so I watched a couple of movies, and saw the end of “He’s Just Not that Into You” about 3 times. It was a sweet movie, with just about every young actress in Hollywood taking part in it. The flight was pretty uneventful, and the eleven hours passed quickly with the help of Drew Barrymore and Jennifer Aniston. My only complaint was that the food on this flight was probably one step below prison fare. The highlight was a small cup of dehydrated ramen noodles with what looked like chunks of spam floating around in it. I think United Airlines must have found some treasure trove of WWII c-rations that they decided to serve us on the flight to save on costs. Next time, I’ll know to bring my own ramen. 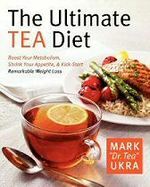 I got a free copy of The Ultimate Tea Diet by Mark "Dr. Tea" Ukra from Parent Bloggers Network to review. I was interested because I need to lose weight, and thought this might be the push I needed to get going. I'm not exactly sure how it got to be the end of January without me actually starting a diet, but eventually, I'll get around to it. I did read the book, and followed some of the advice, but not whole-heartedly. I think it would probably work, not because tea is some miracle drug, but because it advocates sensible eating, exercise, and a reduction of caffeine. He starts out by recommending weaning yourself off of coffee by replacing it with tea that you like--any tea will do. I did this part, and found that I really enjoyed the tea. I didn't get the normal caffeine-withdrawal headache I normally get when I stop drinking coffee cold-turkey. Ukra explains the different types of teas, and has some recipes for cooking with tea that went from things that sounded good to bizarre. I have not been cooking much lately, so I didn't get to try the recipes yet. I haven't followed the diet carefully, but it seems as thought what he is recommending is not terribly radical. It couldn't hurt, and seems much more enjoyable than South Beach or some of the other popular diets out there. I enjoyed reading the final section of the book, which is a history of tea throughout the world. It's interesting to me that so many different cultures enjoy tea in different ways, and in some, it's an almost religious experience. It reminded me of our travels around the world, and how tea time in England is a completely different cultural experience than the tea house I visited in Beijing, that came complete with sipping lessons. We had the chance to participate in a Japanese tea ceremony some years ago, and it struck me then that ritual was somehow as nourishing and warm as the tea itself. I liked the folksy no-nonsense tone of the book. He isn't offering any miracle solutions, just some dietary instruction, recipes, and a great enthusiasm for tea. He didn't recommend any particular tea for optimal results, just a general switch from coffee/soda to tea. He claims that tea contains much less caffeine than coffee, but I have to say the biggest caffeine buzz I ever got was drinking green tea in Japan. I don't know what was in it, but I felt like I was vibrating at one point. It's not the same thing we have here, and the taste was quite different. So, if you're looking to lose a few pounds in a not-terribly-stressful way, check out The Ultimate Tea Diet. Whether or not you lose weight, it just might soothe your soul. Cross-posted at The Silent I Speaks, my review blog where I occasionally review stuff when people ask me to. 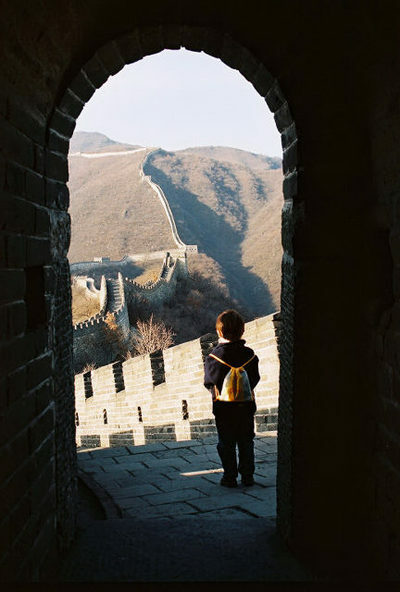 In November, 2004, we traveled to Beijing, China. Frank was presenting a paper at a conference there, and Alex and I tagged along. While Frank was off at the conference, Alex and I took a couple of tours of the city. One was a bus tour of the Forbidden City and the Summer Palace. It was raining off and on that day, which made the city seem enchanting and mysterious. The buildings seemed to rise up from the mist like they were conjured out of a dream. Alex was four at the time, and he enjoyed riding the bus and running around on the grounds of the ancient palaces. Our tour guide, Miss Lotus, was tolerant and kind to him, even though he often interrupted her with questions and refused to stick with the group, either running ahead or falling behind to stare at a dragon sculpture or pick up rocks and put them in his pocket. We got stopped a number of times by groups of Chinese tourists who wanted to take a picture of Alex. He obliged, but started to protest about the fourth or fifth time around, which made the young Chinese women giggle and chase him around the square. They called him "Cutie Boy" and "Lovely Boy" and other snippets of endearing English phrases. It was like traveling with a miniature rock star. Alex remembers flashes of the highlights of our trip--the Great Wall, the preschool we visited, a lady who gave him fruit and candy. 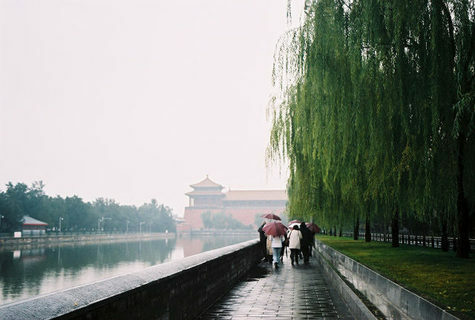 What I remember best are scenes like the ones in this picture--a misty day, red umbrellas and impressive buildings. I also remember friendly people, the clear blue skies after the rain, and the joy of seeing something exotic and new for the first time.